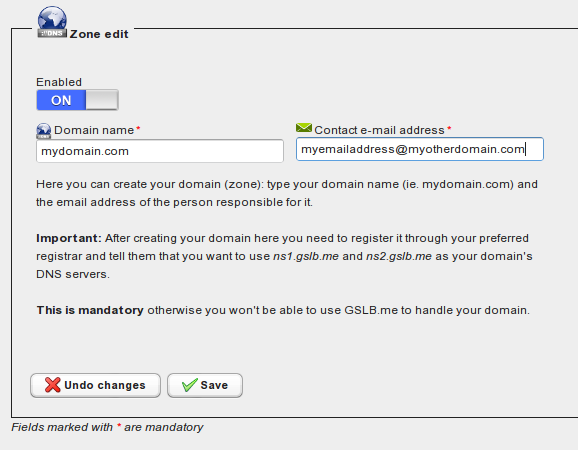 You want to use GSLB.me as the authoritative DNS for your domain “mydomain.com“. mydomain.com can be a new domain you’re about to register, or it can be an already existing domain. Once done, you want to run “www.mydomain.com” from your webserver which sits on an Internet connection with a dynamic IP. 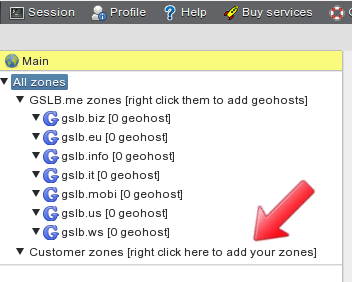 …or by right clicking in the main panel on the “Customer zones” section. The “Zone edit” page allows you to create your domain: here you have to specify the domain name and the e-mail address of the contact person. This e-mail address will be used as the postmaster in the SOA record for your zone. On the left-hand side of the screen click on the domain you just created: this brings you to the main domain configuration page. Here you can change the domain’s contact e-mail address and fully edit your domain records (also called rrsets). Record types A, AAAA, ALIAS, CAA, CERT, CNAME, LOC, MX, NS, RP, SOA, SPF, SRV, SSHFP, TXT are supported. In order to add a new record you simply have to type the record name, select the type from the dropdown menu and assign a value. TTL can be set it to any value in the 30-86400 seconds range. 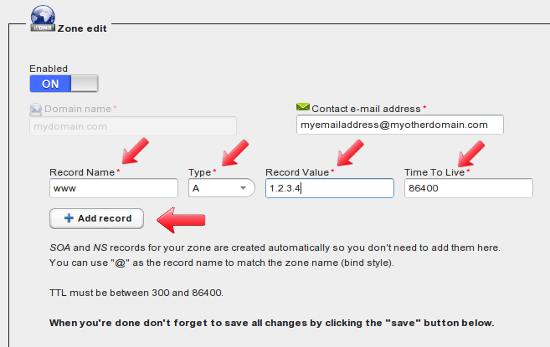 In order to add a record for your zone you have to set the record name, select its type, define the value and set the TTL (free users can’t change TTL: it is set to 86400 seconds by default). When done, click “Add record” in order to save the new rrset. 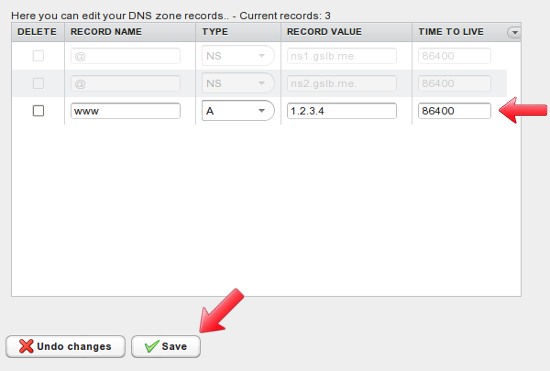 It is required to click on “Save” when all records have been added to your zone. If you don’t do this, your records will be kept but they will not be active. Clicking the “Save” button applies changes and makes all records active and running. After configuring all the records you need (free users are limited to 20 records, subscribers can use an unrestricted number of records per domain) you need to get back to your registrar and tell them that you want to use ns1.gslb.me and ns2.gslb.me as authoritative DNS for your domain (mydomain.com in this example). When configuring a record you can use a FQDN (Fully Qualified Domain Name) as the record value: for instance record “@”, type “MX” can have a value of “10 myothermailserver.myotherdomain.com.”. If the record value ends with “.” it is used as it is. If it doesn’t end with “.” your zone name is added at the end of the specified record value. For instance record “@”, type “MX” can have a value of “10 mail”. This means that the Mail eXchanger for mydomain.com is mail.mydomain.com where “.mydomain.com” is added after “mail”. 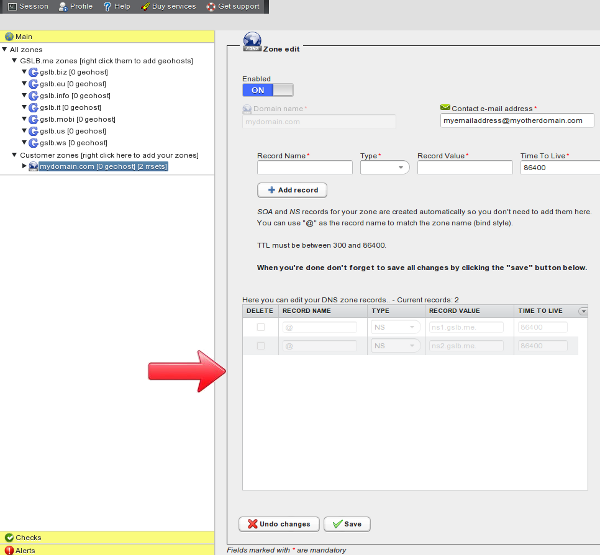 Once this last step is completed, your www.mydomain.com FQDN correctly responds to DNS queries. 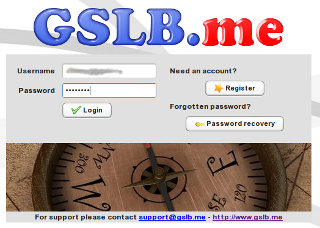 You can install GSLB.me update client in order to tell GSLB.me to associate your dynamic IP address to your FQDN (www.mydomain.com in our example). For correct operations running the update client should be done via crontab every 2 minutes or so, in order to keep your FQDN in sync with your dynamic IP. GSLB.me fully supports the dyndns2 protocol. It is then possible to use any DNS update client or device that can use the dyndns2 protocol to update your dynamic DNS records. pid=/var/run/ddclient.pid       # record PID in file. In addition to using GSLB.me as your authoritative DNS of choice you can seamlessly mix static DNS resolution together with GSLB dynamic resolution to handle disaster recovery, business continuity, CDN offload, geographical balancing for one or more records in your domain (such “smart” records are referred to as “geohosts”). 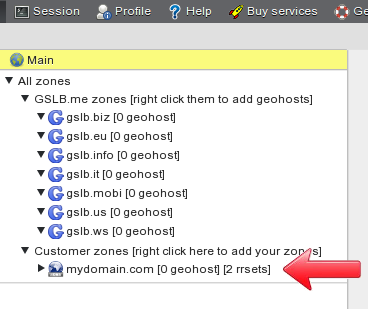 To achieve this, simply right click on your domain name and create your geohosts! 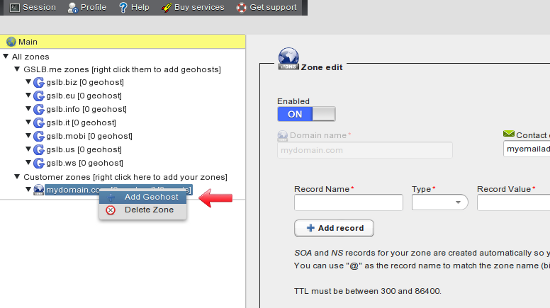 In order to discover the full power of geohosts you can read our other howtos.